The final installment in our Visiting Maine: Where to Find the Information You Need series is on Maine’s wonderful collection of lighthouses. We posted some information on lighthouses witin an hour of Freeport not too long ago, so some helpful information will be found there, too. 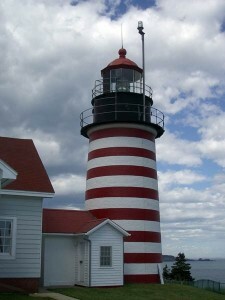 There are a number of web sites with photos and information on the more than 60 lighthouses of Maine. One of the best collections of lighthouse photos is on the Maine Office of Tourism web site. There you’ll find photographs, information on visiting lighthouses, historical and legendary stories, and information for families with children. One of the most complete lists of lighthouses, and maps with GPS coordinates, is at Lighthouse Friends. In some cases they provide a lengthy history of the lighthouse, as well as information on the locations to see some that do not allow public access. The U.S. Coast Guard’s archives also has a list of useful information about American lighthouses. With over 60 lighthouses to choose from, it is not easy to find favorites. In fact, we often feel that our favorite is the lighthouse we’re viewing at the moment! Still, by the attraction of certain photos, and the frequency with which we either visit or recommend certain lighthouses, some do rise to the top. Without a doubt, along the south coast of Maine, there are several favorites. Among them we would choose several from our recent post on lighthouses you can visit within an hour of Freeport, Cape Neddick Light (the Nubble), Portland Head Light (often said to be the most photographed lighthouse in the world), and Pemaquid Point Light (and the views from its rocky bluff). 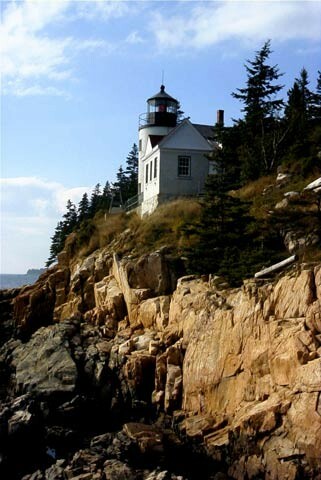 In the mid-coast region, we would choose Owls Head Light (with its spectacular view of Penobscot Bay). Near Bar Harbor, on Mount Desert Island, our favorite is Bass Harbor Head lighthouse (pictured above). Farther up the northern coast (downeast, as we say), is West Quoddy Head Lighthouse (the easternmost lighthouse in the United States, pictured at the top of this post). There are other wonderful lighthouses all along the coast, so we don’t mean to leave any out. People fall in love with all of them, so, as noted above, choosing favorites is not an easy task. Which is your favority lighthouse? Please tell us and explain why in the comments.